Unlike a barcode, the tag does not necessarily need to be within line of sight of the reader, and may be embedded in the tracked object. Radio frequency identification (RFID) is one method for Automatic Identification and Data Capture (AIDC). 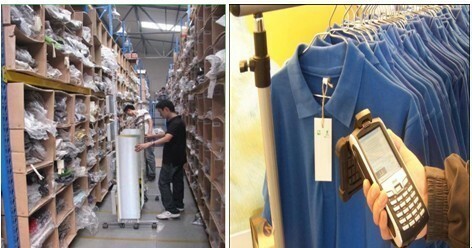 RFID tags are used in many industries. An RFID tag attached to an automobile during production can be used to track its progress through the assembly line. Pharmaceuticals can be tracked through warehouses. Livestock and pets may have tags injected, allowing positive identification of the animal. Clothing tags. Jewellry anti-thief tags. Access control to buildings, parking, hotel rooms, etc.